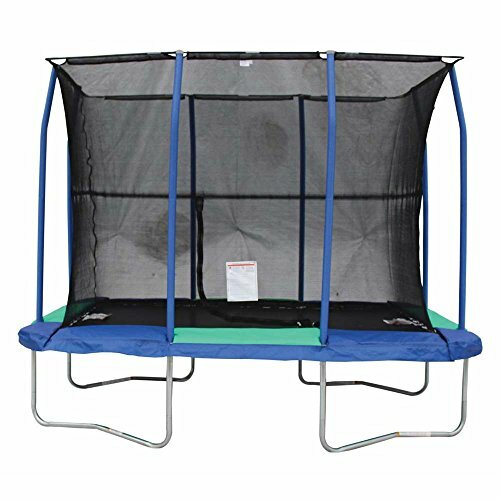 Prevent your kids from bouncing off the walls by letting them burn off some energy bouncing in the JumpKing 7 x 10-Foot Rectangular Trampoline with Enclosure. This trampoline features a polypropylene jumping surface, as well as environmentally-friendly safety pads that protect the 60, 7-inch springs from the elements. The heavy-duty polyethylene netting keeps your kiddos safe inside the enclosure while the heavy-duty steel frame makes the entire structure strong and durable. Easily enter and exit the enclosure with the handy easy-access door and get ready for hours of fun thanks to the JumpKing 7 x 10-Foot Rectangular Trampoline with Enclosure.